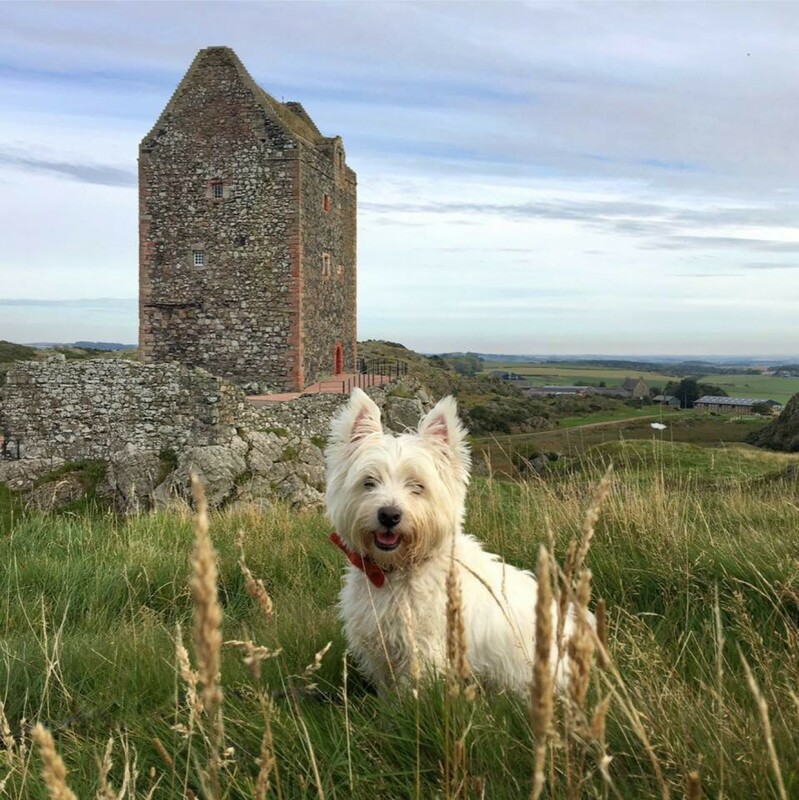 Waterfalls, woolly beasties, wild weather and westies! Having survived a soaking of epic proportion on our first day on the Isle of Mull we weren’t quite so inclined to embark on another drookit trek the following day. Instead, we decided to enjoy a drier tour of the island by car. Casper donned his smart, cable-knit sweater while we opted for that good old Scottish weather survival kit – waterproof wear! The 55 mile drive between Tobermory in North Mull and Fionnphort in the south west, is one of the most beautiful drives in Scotland. It’s my favourite. Our first stop of the day was to admire the ruins of Aros Castle by Aros Mains. Mull looked stunning despite the horrible weather. Next a favourite of mine – these old boats sit beached just outside the pretty village of Salen. I have a really strong tie to them, as they’re one of the things I remember from my first visit to Mull on a school trip in the 1980s. We camped in a field near Salen, and that’s when my long love affair with the island began. The same can’t be said for camping though. Having to eat spaghetti bolognese full of midgies by the camp fire and no en-suite facilities – I’ve yet to be convinced that’s fun! Anyway, back to the boats – when I first saw them they were brightly painted. As each year passes they deteriorate a little more. I dread the day they succumb to old age entirely. They remind me that time doesn’t stand still, life’s to be lived, as like the boats we won’t get any younger. This is an excellent place for spotting wildlife. There are often seals basking nearby and it’s the only place I’ve ever managed to spot an otter on Mull. I’ve also spotted sea eagles soaring nearby. The boy loves a good road trip. Here he is admiring the view of The Three Lochs through pea soup like mist. As we drove into the mountains the mist thickened making our tour atmospheric – not the best for taking photos though. I love the rich, russet colours of the mountains on Mull. It looks so different to Skye, which is bright green, and looks cold and inhospitable in rain and mist. Mull has a rally each year in October. The road above is fairly standard throughout much of the Island. Fancy racing around a hairpin bend on that? It’s an island best enjoyed at a more leisurely pace as you rarely travel far before encountering a traffic jam of some sort! Highland cattle and sheep rule the roads on this island. When we reached Pennyghael we decided to take a wee detour to Carsaig. There are three terrifying roads on Mull – this is one of them. Steep, winding, narrow, first skirting a gorge with thundering waterfall, then a wooded cliff with little or no barrier. Throw in heavy rain and no passing places and what you have is my idea of hell. It is kind of worth it though as you get to see this. Only in Scotland would a phone-box in the middle of nowhere, next to a thundering waterfall seem like a good idea! In the photos above you can see the white of the water thundering down the hill behind the tree. Surely the only phone-box in Britain that comes with a free but compulsory shower. The avid movie buff amongst you may know this spot from the 1945 movie ‘I know where I’m going!’ which was shot on the Isle of Mull. It’s definitely worth the scary drive to get to Carsaig it’s a gorgeous, remote part of the island. It feels a million miles away from the rat race. We suffered a minor soaking and wind blasting to enjoy this spot for a while after the Wee White Dug kindly alerted us to something interesting. He’d been banging on about sea dogs for a couple of minutes before we realised what he meant. The sea in front of us was full of curious watchers. Lots of little black heads and peeping eyes were observing us – the sea dogs were seals. I’m a sucker for the wild beasties of Scotland and love seals. I saw my first ever seal on Mull whilst canoing on that school trip, many moons ago. Growing up in an Edinburgh housing estate, I didn’t even know we had such exotic creatures living on Scottish shores! What goes down must come up, so I had to endure the road of terror once more as we continued our driving tour of the Isle of Mull. We met this guy or gal at the end of the road of terror and stopped to watch for a while. It’s awful but the first thing I think when I see a turkey is Christmas! May you live in Narnia buddy, where it’s always winter but never Christmas. We decided we’d eat an al fresco lunch of sorts in the car, so headed to the Bakehouse in Bunessan after finding a perfect parking spot, with uninterrupted views across the bay. Yet again we hit the good food jackpot. I had a delicious potato tortilla which Casper enjoyed as much as I did. I’ve seen Popeye eat spinach slower. We also had some lovely home made soup, piping hot coffee and a ten minute bicker about whether our sweet treats were German Biscuits or Empire Biscuits. I grew up calling them German biscuits, Mr G Empire. Turns out we were both right. They were German until the First World War when just like the Royal Family their name changed to something more suitably patriotic. What we did agree on was that whatever they were called they were the tastiest we’d ever eaten. I’ve been to Fionnphort many times over the years, mostly to hop on the ferry to Iona, but it’s worth a visit in its own right. The views across to the tiny island of Iona are gorgeous. The rock at the beach here is the most amazing pink colour too. You’ll also find Fingal’s Rock on the beach. It’s a huge split rock said to have been hewn in two by Fingal the giant of Fingal’s Cave fame. Being compulsive road trippers we managed one last detour, even though we’d reached the supposed final destination of our road trip for the day. Fidden where apparently the camping is so good the sheep are willing to queue round the block in the rain for the best pitch. The beaches aren’t bad either. A great day out, and proof that poor weather doesn’t mean staying indoors. Meanwhile, back in Tobermory we toasted another wonderful trip to the fabulous Isle of Mull. And no, the boy wasn’t allowed to toast the trip with a Baileys! I keep looking for the “Like” button as I so enjoy reading your blog and seeing the photos. We spent a month in Scotland back in 2009 and had rain every single day. But, that didn’t stop us from having a fabulous trip and taking many (10,000 between three cameras) pictures. It was a huge job to weed them out to a manageable amount. We are overdue for another trip over and hope to make it in 2018. Keep on travelling! Brilliant! Fantastic blog! The photos & the great stories. And I am amazed by one thing: I’ve been in Scotland for four years now and I had no idea they had wild turkeys here! I’m from the Texas Hill Country where they pop up around every bend in the road. Thank you – I think they were free range farm turkeys sadly so probably destined for the Christmas dinner plate. We are leaving Scotland in a few days as our tour of the UK is now taking us to England but I can’t wait to go to Mull! I know what you mean about the weather, we’ve been hiking on the Berwickshire Coastal Path yesterday and it was raining all day but we still loved it! I wish the path hadn’t been so muddy but I didn’t mind the rain. Superb photos of one of my favourite parts of the world! I know those roads well. Beautiful in any weather! I understand why you didn’t want to leave. Thank you for sharing your memories! So you picked up a car in Oban (or somewhere else), then ferried it across to Mull? i don’t mind driving in Scotland, even though meeting those potato hauling semis on blind corners with a mountain on one side and a stone wall on the other made me feel like we cheated death more than once. Even though we live in a very rural part of Missouri, the minor highways in Scotland often seem like one-way roads in places. However, after 800 miles and four different cars, i managed it with narry a scrape (although i did turn the wrong direction once!) Mull looks challenging – is there a lot of traffic? do you recommend taking the car? or taking the bus with the goals of exploring the island and going to Iona? Good wee travelogue Sam! One of my best memories of Islay was being storm stayed an extra night. My cousin and I went out in the gale and were blown into Laphroaig where we were gifted a free dram for looking so forlorn. When we used to go canoeing after high school, I became known as Chief Dryfoot for my penchant for not getting wet. ( well that and my aversion to leeches) So yeah, don’t let the weather get you down, you might miss something! Ha ha I love that story Andrew. I loved Islay. Such a beautiful Island and a whisky lovers dream. Not being a whisky drinker myself I developed a fondness for The Botanist Gin made by Bruichladdich. Heaven in a glass. I am hoping for next year. This summer we are going to Rome, which is exciting too 🙂 But Scotland’s landscape is what really speaks to me. It’s a lovely island even in the rain! I’ll cross my fingers for a fabulous sunny Skye trip. We’re staying on Raasay in September for a short break. Such a lovely part of the country. I’ll need to delve in. I love Plockton. The west coast is stunning.